Retirement planning is a complex but highly rewarding process that allows you and your family to take control of your financial future. If you are within ten years of retirement, it is highly critical to get a retirement road-map in place and to start getting familiar with some of the hurtles you must plan for and ultimately overcome to live a comfortable and stress free retirement. Our goal with every client is to bring all the moving pieces of retirement planning together into one clear and actionable strategy that takes the mystery out of when and how to retire. Below are some of the topics we provide individual guidance on throughout the retirement planning process. From basic living expenses to travel and hobbies, everyone’s lifestyle will look different in retirement. That’s why it’s important to carefully categorize and rank all your retirement goals and what each will cost over time, so they can be properly budgeted for. Is your portfolio set up for sustainable retirement distributions? When retirement is right around the corner or has already arrived it is vital to know how much risk is appropriate for your portfolio to balance long-term growth with downside protection. That’s why every client is informed on how their retirement income could be affected by the market so there are no surprises down the road. You worked a long time for it, now let’s max your benefit! Before beginning your pension in retirement there many things to consider, such as lump-sum buyouts, spousal continuation options, and cost of living adjustments. In most cases, you only get one opportunity to pick what options you want, so it is absolutely critical to make informed decisions that maximize the benefits you receive. Taking social security at the perfect age can make a monumental difference over the course of your retirement, and the right answer varies based on your situation. That’s why we take the time to show each and every scenario available to you, and map out what it would mean for your retirement income over the course of your life. Integral to a successful plan is having awareness as to how you will be taxed on each of your investment accounts like a Roth IRA or Traditional IRA now and in retirement and having a strategy behind it. If you build wealth without proper regard to tax strategies, it can result in paying Uncle Sam far more than you might think. What will your groceries, gas, insurance, and your other daily needs cost in twenty years? Inflation can often act as a hidden tax that sneaks up on those who don’t plan for it. That’s why getting the most accurate inflation estimates on your spending goals is vital to a successful plan. In retirement, your healthcare needs will most likely look dramatically different than today. Estimating the rising cost of Medicare, Medigap, out of pocket, and possible long term care expenses can be very difficult. Making sure your plan includes accurate projections can make all the difference, that’s why we take the time to break them all down one by one, so you know the potential costs. Americans are living longer and the importance of planning for the appropriate mortality tables cannot be understated. In every plan we show you the success of your plan based on how long you live so you make sure not to outlive your money. By setting financial goals, developing and implementing financial strategies, and monitoring progress on a regular basis, the likelihood of working towards your goals is greatly increased. Establish your goals and objectives – Assessing your current financial situation and to identify your priorities and concerns. 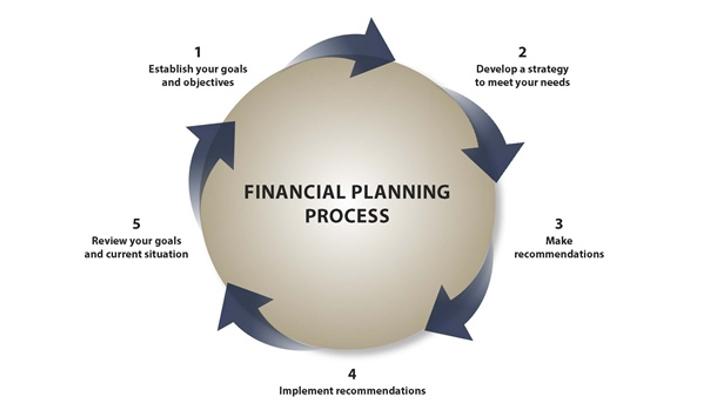 Develop a strategy to address your needs – Gathering information to develop a profile of your current situation, including a review of your financial information and relevant documents. We will analyze this data to be certain we understand your unique situation and how to address it. Review your goals and current situation – Reviewing periodically your financial situation. At a minimum, we recommend you assess the need for any changes annually. Even the best financial plan must be monitored on a regular basis to make sure you are continuing in the right direction.